Norman Bates, Michael Myers, Leatherface: These are some of the most well-known horror film characters in Hollywood, but you need more than a maniacal protagonist to set the mood. Real estate often plays a big role in creating the horror film experience. Here’s a look at some of the iconic homes that have had audiences screaming for decades — some of which may be on the market today! 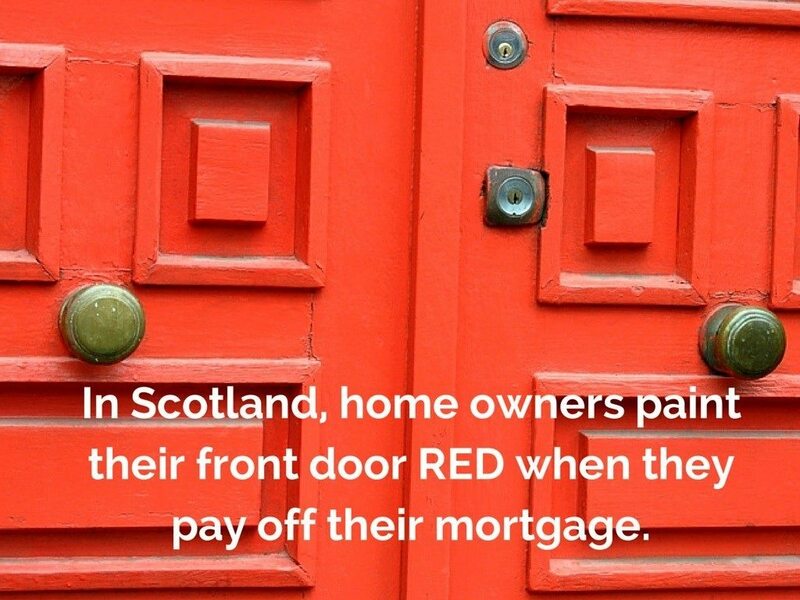 Real estate often plays a big role in creating the horror film experience. Warning: If horror movies aren’t your thing, and you haven’t seen some of these films, there may be spoilers ahead. The dark, foreboding home that sheltered Norman Bates’ (Anthony Perkins) shocking secrets is one of the most iconic, spooky structures in cinematic history, but it may surprise some to know that the Bates Mansion — or the “Psycho Home,” as it’s come to be known — is not real. 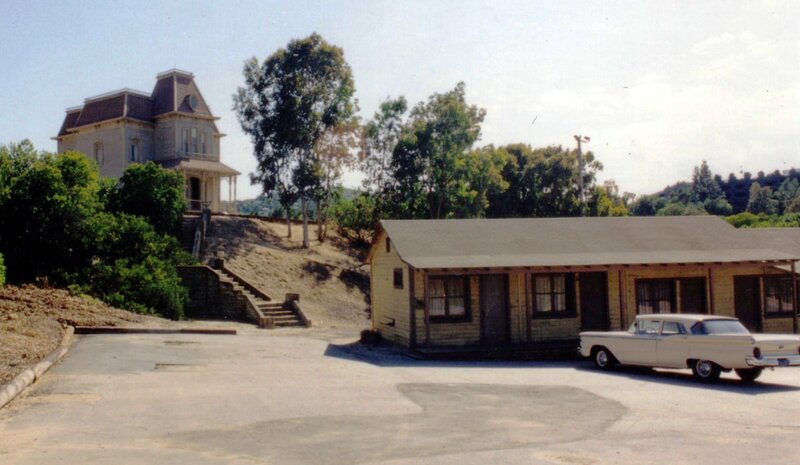 The home — or the two facades that comprised it, anyway — was actually constructed on the backlot of Universal City Studios and had no right side because it is never seen on camera in Alfred Hitchcock’s film. Designed by art directors Robert Clathworthy and Joseph Hurley, the house was loosely based on an Edward Hopper painting called “House by the Railroad.” Interiors of the house were also constructed on a Universal sound stage, as Hitchcock preferred to shoot in a controlled environment. The home was featured in several television and film productions before being reconstructed and moved to a new location, where it can be viewed today as part of the Universal Studios Tram Tour. As for the one-story roadside motel where Marion Crane (Janet Leigh) meets her demise? That, too, was a studio fabrication and may also be viewed on the studio tour. There are actually several idyllic, suburban homes featured in this small, independent film-turned-cult-classic: The old Myers house, where young Michael Myers murders his teen sister after a tryst with her boyfriend; the house where heroine Laurie Strode (Jamie Lee Curtis) lives; the house where Laurie’s friend Annie (Nancy Kyes) babysits the neighborhood children and where she and her friends are slaughtered by escaped mental patient Myers; and the house where Laurie looks after the children while her friends take advantage of a few parent-free hours before meeting their doom. The film is set in Haddonfield, Illinois, on Halloween night, but was shot in Pasadena, California, in early spring. The film’s shooting location and modest budget of $300,000 proved to be a challenge for the crew, who had to buy paper leaves, paint them in autumn colors and scatter them in the filming locations — then collect them and reuse them in other locations later. Discerning viewers will take note of some visible palm trees in the background of some shots. The Myers house, which was abandoned and empty when it was used in the film, was renovated and moved across the street to 1000 Mission Street. It became a chiropractor’s office, then a multi-office space. The Doyle house, where Laurie ultimately kills Meyers (or does she?) is located at 1530 North Orange Grove Avenue. All of the films in this freaky franchise are based on the 1977 novel of the same name, penned by Jay Anson. 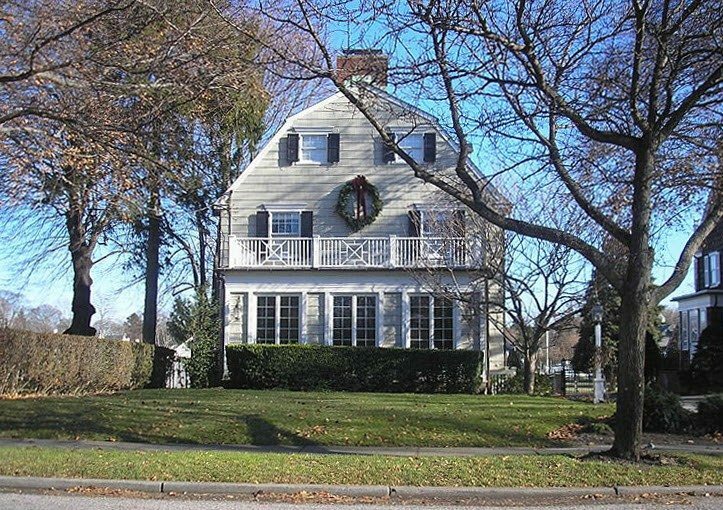 Sold as a “true story,” the work was based on the alleged experiences of George and Kathleen Lutz at their residence at 112 Ocean Avenue in Amityville, New York. According to Anson’s book, the Lutzes purchased the large, Dutch Colonial home with iconic “eye” windows in 1975 for the “bargain” price of $80,000. The house had sat vacant for a little more than a year after Ronald DeFeo, Jr., shot and killed six family members there. DeFeo was later convicted of second-degree murder. 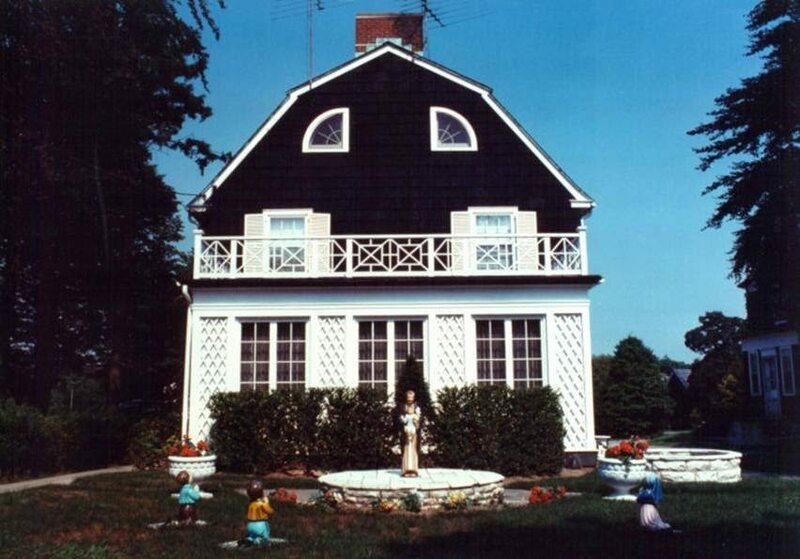 The original ‘Amityville Horror’ house. In the meantime, the Lutzes — who knew the property was stigmatized and gained the DeFeo family’s furnishings in the sale — allegedly began to notice a series of frightening paranormal events inside the home. According to Anson’s book, following an unsuccessful clergy exorcism of the property, the Lutzes fled the property, leaving their possessions behind — although some of the events depicted in the books and movies are believed to have been embellished for dramatic effect. The ‘Amityville Horror’ house, renovated. The 1979 film was shot at 18 Brooks Road in Toms River, N.J., and was supplemented with superstructures to make it look like the “real” home. After being sought out by fans for years, the property last sold in 2013 for about $350,000. For the 2005 remake, the production team altered the home located at 27618 Silver Lake Road in Salem, Wisconsin. Kathy Lutz died shortly before production, and a fisherman died accidentally in a nearby lake. The original home in Amityville has been significantly altered to make it less recognizable to tourists. In fact, the address was changed to 108 Ocean Avenue, to protect the owners’ privacy. The home last sold for $950,000 in September 2010. This 1973 supernatural horror film, based on the 1971 novel of the same name, broke a lot of ground. It was the first horror film to be nominated for Best Picture at the Oscars, and Warner Brothers’ highest grossing film of all time (when adjusted for inflation). Audiences fainted and vomited at the sight of a 12-year-old girl (Linda Blair) possessed by demons, and her mother’s (Ellen Burstyn) attempt to rid her of evil via exorcism conducted by priest. 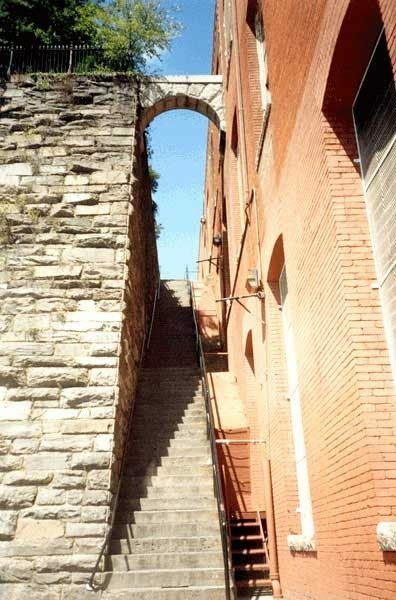 In the film, the location used for the home where much of the action takes place is 3600 Prospect Street Northwest in Washington, D.C., where the character of Father Karras (Jason Miller) tumbles down a flight of exterior steps to his death. The film crew constructed a false front to the house for the scene. But the home that hosted the events that actually inspired the epic saga is actually located in the St. Louis area. The case, known as the “Roland Doe Exorcism,” involves a 13-year-old child of the same name who allegedly attempted to contact his deceased Aunt Harriet using a Ouija board. Supernatural activity ensued, including strange noises and furniture moving in Doe’s St. Louis house. Doctors examined Doe, finding no explanation for the disturbing events taking place. Local religious leaders attempted to intervene, to no avail. Finally, over the course of several weeks, exorcism rituals were performed on the Doe home, where young master Doe exhibited an aversion to anything considered sacred and lay on a shaking bed amidst falling objects while words such as “evil” and “hell” appeared on his body. The exorcisms concluded with a loud, unexplained noise, after which Doe went on to live a happy, successful, spirit-free life. The home where the alleged real-life events took place, located at 8435 Roanoke Drive in Bel-Nor, Missouri, last sold in 2005 for $165,000, about $4,000 under asking price. The private residence will actually be the subject of a “live exorcism” on cable station Destination America at 9 p.m. CT on Oct. 30. Both the original 1974 film and its earnest 2003 remake are based on the character of “Leatherface,” who was inspired by real-life serial murderer Ed Gein. 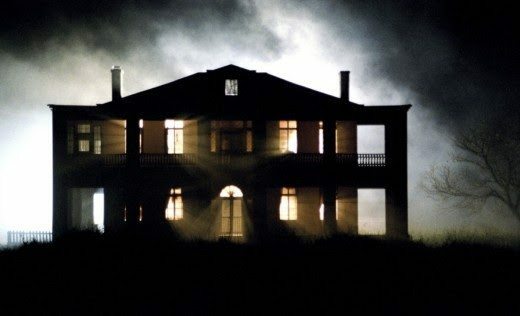 The original film, directed by Tobe Hooper (who later directed “Poltergeist”), was shot in a early 1900s farmhouse located on Quick Hill Road near Round Rock, Texas. The house was later moved to Kingsland, Texas, and has been repurposed as a restaurant. Produced on a modest budget of $300,000, the film used a cast of relatively unknown local actors and was so financially constrained that the actors reportedly “took years to cool off” from the hot, humid Texas weather…and real blood somehow made an appearance. The original ‘Texas Chainsaw Massacre’ house. 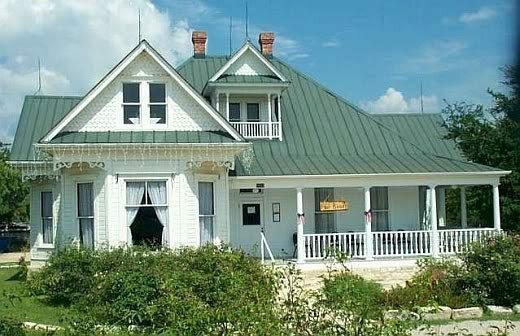 The home used in the ‘Texas Chainsaw Massacre’ remake. In 1957, Gein was convicted of first-degree murder, diagnosed with schizophrenia and sent to a state mental health facility, where he died in 1984 of respiratory failure due to lung cancer. On the verge of becoming a tourist attraction, Gein’s house and property were scheduled to be auctioned in 1958, but were destroyed by a fire just days before the auction was to take place.